Nish Kumar is touring UK with his fifth solo show Nish Kumar: Actions Speak Louder Than Words Unless You Shout The Words Real Loud. He plays Brighton Komedia on Wednesday, November 16. 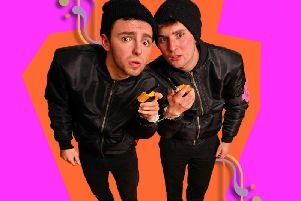 Spokeswoman Helen O'Brien said: “This follows a month long run at the Pleasance Courtyard Cabaret Bar in August. “Last year Nish received a Fosters Comedy Edinburgh Award nomination and had the best reviewed show with the critically acclaimed sell out that was ‘Long Word… Long Word… Blah Blah Blah…I’m So Clever’, which went on to tour the UK and included a 4 week run which was extended at London’s Soho Theatre. “Following on from last year’s show ‘Actions Speak Louder Than Words Unless You Shout The Words Real Loud’ is similarly political. This show includes topics like gentrification and colonisation. He wonders, have rich people ruined the world? Are hipsters and trendy people to blame for bad legislation? And why are we still proud of the British Empire and not ashamed? He puts across his own conspiracy theories. He also moots is there any point in doing comedy about politics? Does shouting form the sidelines actually achieve anything? Is profiting from political comedy a double standard? “Alongside stand-up Nish is also a frequent voice and face across both television and radio. Since 2015 he has hosted the topical comedy show, ‘Newsjack’ for Radio 4 Extra, which earlier this year won the Rose D'or for Best Radio Comedy Show. On screen you can catch up with Nish on the likes of Live From The BBC, Have I Got News For You (BBC), The John Bishop Show (BBC One), Russell Howard’s Stand-Up for Central (Comedy Central), The Alternative Comedy Experience (Comedy Central), Live at the Comedy Store (Paramount), Alan Davies As Yet Untitled (Dave) and Live At The Apollo (BBC Two). In December 2015 Nish was selected by Sky Arts to write a special Comedy Christmas Short in which he also starred. 2016 looks set to be big for Nish with various radio and television projects in development. Nish is also due to appear at the Just 4 Laughs Comedy Festival in Montreal.